Naval Group India, which was established as DCNS India, is a 100 % owned subsidiary of Naval Group that is headquartered in Paris, France. Established in September 2008, it has its presence felt in 2 major cities: Mumbai and New Delhi. The main purpose of Naval Group to be in India would be to support the Indigenisation through ‘Make in India’ activities for Scorpene® submarine equipment, to develop the Indian defence eco-system, as well as to develop design services in India with talented Indian engineers. Naval Group India has displayed continuous efforts of participating in various defence and renewable energy endeavours for the Indian Navy by empowering Indian industrial partners to cater to the requirements of the Indian shipyards and the Navy. Self-reliance, empowerment and innovation are the driving force for Naval Group India to better serve the rich Indian coastline. The thrust to the industrial progress of India can be clearly attributed to the one-of-a-kind initiative called Make in India. India proves to be a strong contender on account of its increasing manufacturing skills. Strategically significant projects have seen increased participation of indigenous content through a complex process of transfer of technology. Convergence of knowledge, ideas and competence amongst a wide array of cultures introduces an interesting element in the success story of indigenisation. The endeavour of Naval Group India is to be a visionary and to further its involvement in empowering more and more industries by creating a robust eco-system that can cater to the varied defence needs of the country. R. Adm. Rahul Shrawat graduated in Electronics & Communication Engineering from IIT (Indian Institute of Technology), Roorkee. He did his post-graduation in Radar & Communication Engineering from IIT Delhi. As an Electrical officer he served the Indian Navy for 36 years. He has been Joint Director at Directorate of Electrical Engineering and Director at DND Surface Ship Group at the Indian Naval HQ at New Delhi. As Captain/ Commodore, he looked after maintenance of ships and submarines as General Manager (Technical) at Naval Dockyard, Vizag. As a Flag Officer, he served as the Project Director of a strategic project of the Indian Navy. He also served as Chief Staff Officer (Technical) at Western Naval Command, Mumbai. Later he rose to become Admiral Superintendent Dockyard (ASD) of Naval Dockyard, Mumbai. As ASD he was responsible for the entire Naval Dockyard and its activities and operations. He thereafter moved back to New Delhi as Director General WESEE, a prime organisation of the Indian Navy, dealing with real-time software, weapon system integration & cyber security. On 29th Feb 2012, he joined Mazagon Dock Shipbuilders Limited (MDL) as Chairman and Managing Director. 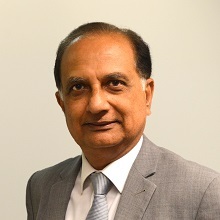 He joined Naval Group India as Chairman and Managing Director on 01 January 2018. Engineer with extensive experience in the Defense domain, and in particular in the naval field with various positions hold in business development, marketing, sales and operations for different Companies. He has to his credit, years of rich knowledge of the Indian defence eco-system which is instrumental in successful transfer of technologies to the partner. With formal management education from UCLA, he has had close ties with the Asia Pacific Region since 30 years and has made Delhi his abode since the last 13 years. In India, he heads the liaising office for Naval Group India in New Delhi and strives to create a robust defence eco-system. His guidance, advice and problem solving abilities are instrumental for new projects from Indian Navy and Ministry of Defence. Recognising new opportunities for Naval Group India and for India as a country, is his forte. Moreover, he plays an important role in the communication strategy with the media. His interests include reading and he has profound knowledge on spirituality. Sandeep Agarwal is ex-Indian Navy with 21 years of experience and a submarine specialist. His vast experience includes submarine operations, maintenance and repairs. He was also involved in design of non-conventional submarine and has undergone extensive training at Russia. He was instrumental in indigenisation of submarine equipment’s and alloys. He has held various positions in Naval Dockyards and has developed a vast eco system for supporting submarines in India which includes, indigenisation, vendor development, writing documents/procedures, and material & project management. He is presently heading the Department Bids & Projects and is mobilizing coordinated efforts with various stakeholders to provide maintenance support to Scorpene submarines. He is also leading the activities to develop the Indian ecosystem to answer to further submarine requirements of Indian Navy. With his vast experience, technical knowledge and familiarisation with major customers, he is playing an important role in increasing the presence of the Naval Group in India. Nilesh Mishra joined Naval Group India in June 2016. He is a graduate from Mumbai University and is also an Associate Member of The Institute of Chartered Accountants of India. He has 18 years of experience in the Finance & Accounting functions and has worked with several multinational companies. He leads Finance & Accounting operations of Naval Group for India based in Mumbai. As an engineer from the prestigious institute IIT Kharagpur who specialised in Electrical Engineering, Prashant Chattopadhyay brings his expertise, resulting from 35 years of rich professional experience with Mazagon Dock Shipbuilders Limited to Naval Group India. He started his career in surface shipbuilding which further progressed to submarine construction, quality and operation. In Naval Group India, his key role revolves around technical and commercial aspects of the ongoing P-75 project. His involvement and guidance as Head of Operations, is a significant support for Naval Group India and MDL activities. Copyright © 2019 Naval Group - All Rights Reserved.